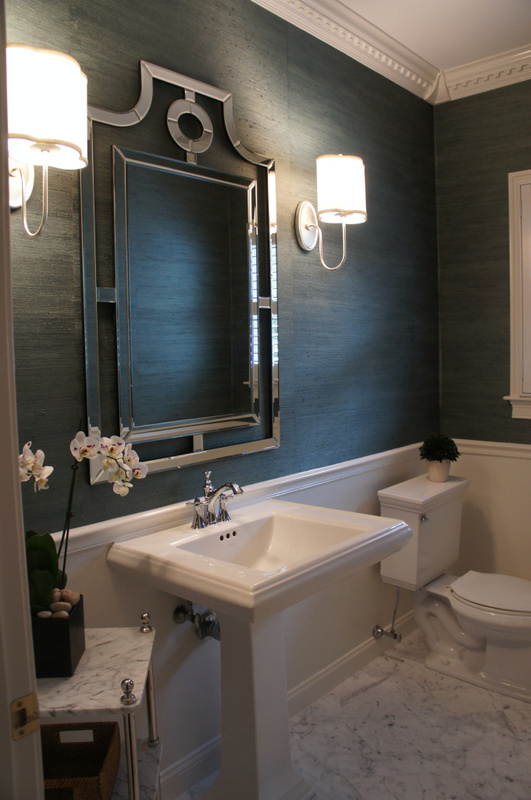 Work is finished on our first floor guest bath, and I have to say it was quite a painless process, and worth the time and money. In my last post I referenced wanting to give the space a fresh, updated look while increasing the amount of light in the room – without a big investment. Mission accomplished! 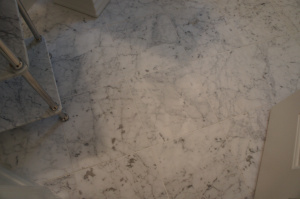 Starting at the floors, I chose a honed marble – it’s never dated, and lightened up the room from the bottom up. 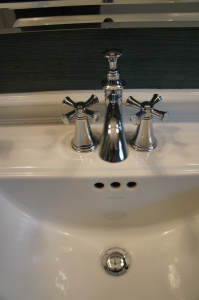 I did not replace the pedestal sink or toilet – but I did replace the old faucet with a polished chrome one, which makes the sink feel entirely new! As to the walls, the last look had dark wall on the bottom – which drew your eye to the (ugly) floor. 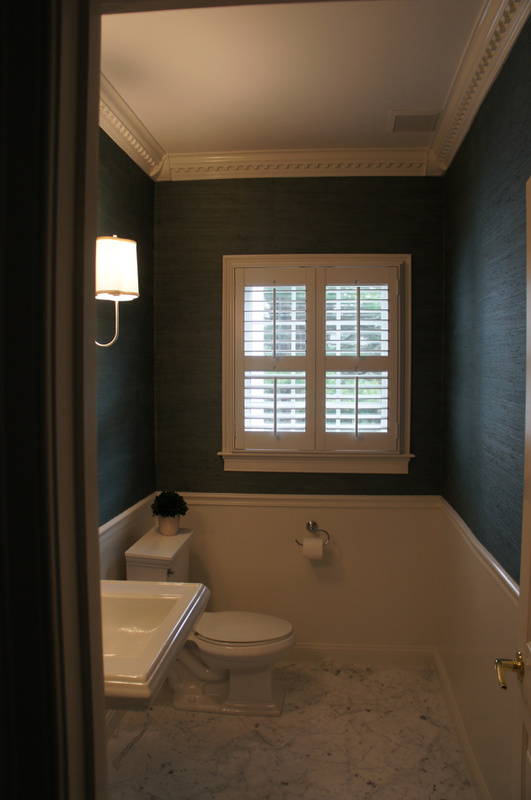 I swapped that out – putting the darker wall color color on top, which raises your eye to appreciate the dentil moldings. I knew I wasn’t doing a fabric window treatment (because of the light blocking issue) but I needed to soften all the hard surfaces in the room – so I used grasscloth instead of paint or regular wallpaper. I LOVE the color – it’s rich and varied – has some brown and greeny undertones. 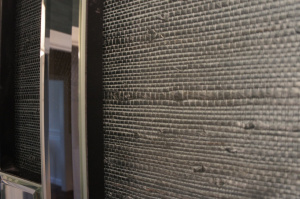 The texture is so amazing – slubby and as interesting up close as it is away. I think the texture makes it not fun to install, but my painter did a great job (if he was swearing, I wasn’t home to hear it!). For the mirror I went BIG – not only in size, but in style. 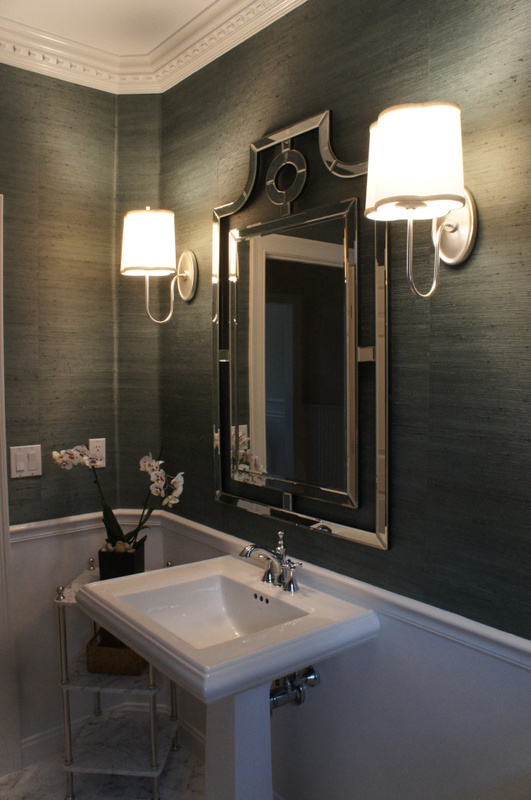 Same with the light fixtures from Barbara Barry for Visual Comfort. Instead of chandelier bulbs, this fixture takes a 75 watt bulb – which made a huge difference in the amount of lighting in the room. I still need my accessories – a waste basket and hand towels – but everyone is enjoying the “new” room in our house!